The 21st Annual SCOTTY Fund Town Picnic is happening on September 9th in Bethel. Come for lunch or dinner and enjoy some local food vendors. The $7 donation to get in the door includes amusements and entertainment. There will be pony rides, inflatables, “all you can” eat ice cream, you can climb a rock wall, listen to live music and much more! 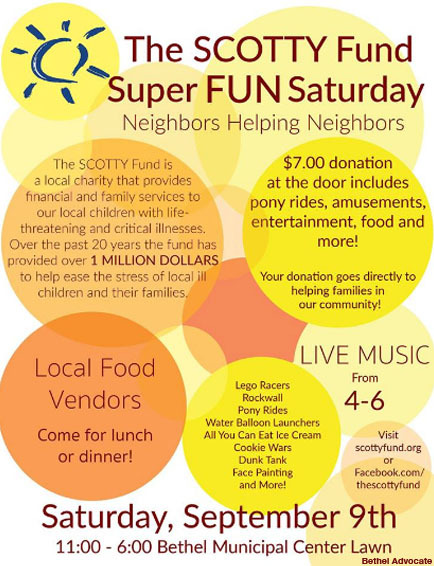 The SCOTTY Fund is a local charity that provides financial and family services to our local children with life-threatening and critical illnesses. Over the past 20 years the fund has provided over 1 MILLION DOLLARS to help ease the stress of local ill children and their families.